Will the S Edge look much different from this? 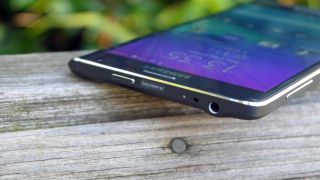 A rough estimate puts the entry level Galaxy S6 and Galaxy S Edge at $847 (£563 AU$1,087) and $964 (£638, AU$1,233), respectively, but we all know that's not how this will shake out. Based on these early prices, it's safe to expect to Galaxy S6 to come in closer to $699 to $799 unlocked in the US, and the S Edge to enter the market at $749 to $849 unlocked. The 16GB Samsung Galaxy S5 is going for $519 on Amazon as of this writing, though that's down from its $799 (£579, AU$799) base price, so things could turn out very differently once it's all official. Stacking these prices up against Samsung's archnemesis would also give the Korean firm reason to come in at $649 (£539, AU$869) – that's exactly what the entry-level iPhone 6 calls for unlocked from most carriers and Apple itself. And it's likely within which bracket the iPhone 6S will fall, too. But until MWC 2015, we won't know much more for certain. Barcelona just got that more interesting. We've reached out to Samsung for comment and will update with any additional information. Meanwhile, how's that iPhone 6 Plus looking?